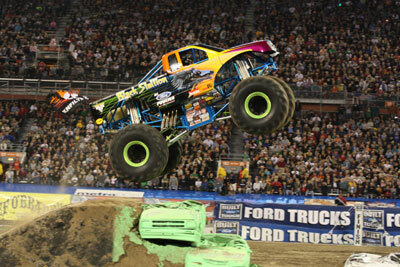 Nothing grabs the spectator’s attention like a heart pounding 10,000 pound monster truck. 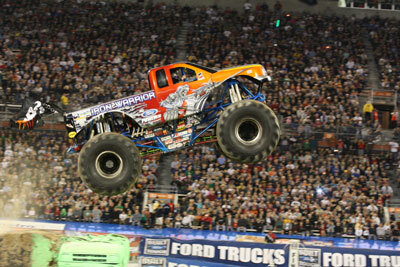 Independent track owners, fairs and businesses across the nation recognize the drawing power of a monster truck. These giant Monster trucks draw crowds of people as they make thunderous noise with their 1500 horsepower engines.Monster trucks are rated only third to NASCAR and NHRA as one of the most popular motorsport event. 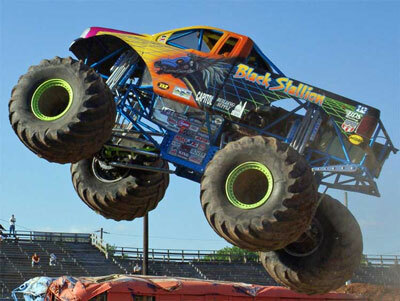 Our events include monster truck racing competition performed side by side over piles of cars or “Chicago” style over cars. A full timed qualifying competition heat will take place to decide running order for the trucks in the show. Standard bracketed elimination round racing will take place to determine who the champion of the night is. 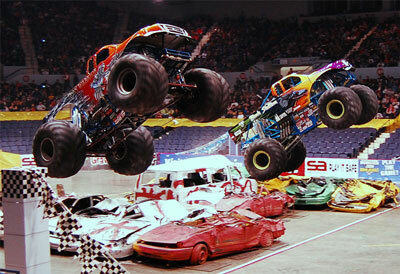 The monster trucks will compete in wheelie, donut and the crowd’s favorite monster destruction freestyle competitions. The audience will determine the winner of these contests by way of a cheer off. We can also provide Monster Ride Trucks. Here's your chance to ride in a actual monster truck and feel the power. This is a great attraction and the kids love it.